A video of Dr. Yusuf al-Qaradawi calling on the U.S. government to wage jihad for Allah in Syria, is currently making the rounds on Arabic media and Facebook, to mockery and dismay. 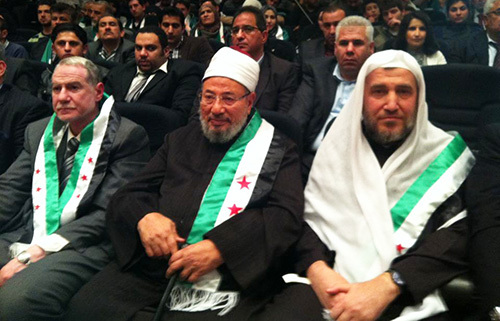 In the recorded speech, Qaradawi—one of the most influential Islamic clerics in the world, spiritual leader of the Muslim Brotherhood, author of over 100 books on Muslim doctrine, and head of the International Union of Muslim Scholars—sarcastically thanks the U.S. for supporting the "freedom fighters" in Syria, adding that "Allah willing, your [U.S.] aid will increase." Then, while working himself up because the U.S is only providing weapons to the jihadis in Syria, as opposed to directly intervening, Qaradawi declares in frustration: "We want America to take a manly stand—a stand for Allah!" Needless to say, all Muslim Brotherhood opponents in the region are pointing to this as yet more proof that Qaradawi and the Brotherhood are mercenaries who interpret jihad any which way, so long as it helps them consolidate power: otherwise, how can "infidel" America take "a stand for Allah" by waging jihad on fellow Muslims? It should further be noted that the classic formulation of the Arabic word jihad, as in "fight," appears in the Koran with the addition fi sabil Allah, that is, "fight in the cause of Allah." In other words, calling on the U.S. to strike Syria's Bashar Assad—and calling it "a stand for Allah"—is essentially synonymous with calling on the U.S. to fight "in the cause of Allah." Amazingly, then, Qaradawi employs classical jihadi rhetoric to incite American leadership to action. Sheikh Qaradawi of course is the great and prominent Sheikh of Jihad, who issues those famous fatwas we all know of to kill and destroy on his orders. Really, the man has reached the point where he is now calling on America to wage jihad and take a stand for Allah. No comment; what's there to say at this point?… Now jihad is being asked of America and to be waged against Muslims. [T]he current administration consistently and repeatedly appeared to respond eagerly to the calls for revolution from the Muslim Brotherhood's senior Islamic scholar, Yousef al-Qaradawi. When al-Qaradawi said that Mubarak had to go, the U.S. waited a whole three days before throwing America's key ally in the Middle East for over three decades under the bus. When al-Qaradawi called for Libyan rebels to kill Muammar Qaddafi (so the al-Qa'eda jihadis in his jails could get out and join the revolution), the U.S. led the Western military campaign that brought al-Qa'eda, the MB, and chaos to Libya. And when al-Qaradawi issued a call for jihad in Syria, in early June 2013, the U.S. quickly issued an invitation to Abdullah bin Bayyah (al-Qaradawi's vice president at the International Union of Muslim Scholars), who told an Al-Jazeera reporter that, "We demand Washington take a greater role in [Syria]." It took the U.S. less than one week after al-Qaradawi's fatwa to announce authorization of stepped-up military aid to the al-Qa'eda-and-Brotherhood-dominated Syrian rebels. The White House announcement came just a single day after bin Bayyah met with National Security and other senior administration officials. The problem, then, is not that Qaradawi has in desperate senility confused the U.S. with the jihadis, but rather that he may know that prominent elements of U.S. leadership are committed to struggling "in the cause of Allah"—and so he unwittingly employed jihadi rhetoric to remind them of their duty. Unfortunately, in today's surreal climate of U.S. politics, no interpretation is so absurd as to be implausible.